Janice Goudie was in her first week on the job as a reporter at the Gander Beacon, the weekly paper for the town of about 9,000 people in central Newfoundland, when she saw the news of a plane hitting one of the World Trade Center towers on Sept. 11, 2001. 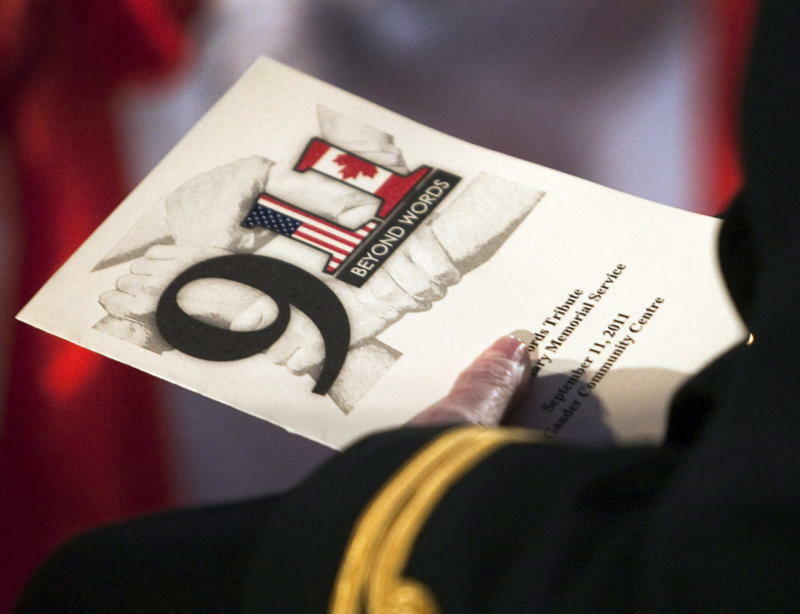 “At the time it didn’t really mean much,” Goudie tells Yahoo Canada News. She was 21 years old, new to Gander, and New York City seemed an entire world away. But the news soon came that about 500 planes flying over the Atlantic when the attack began would not be allowed into U.S. airspace and were being redirected to various international airports. “The editor said ‘get up to the airport right away,’” Goudie says. She spent the next five days covering the story of more than 6,595 people from the 38 planes rerouted to the town’s international airport. Gander and the surrounding smaller towns of Appleton and Lewisporte quickly mobilized to shelter passengers and crew who couldn’t even take their luggage off the planes, providing food, shelter, supplies and emotional support. The resulting connections between the passengers and Gander once known as “the Crossroads of the World” led to lasting friendships, many return visitors and a scholarship program for local students. Some of the people who were stranded in Gander on 9/11 will be back in town this weekend, Gander Mayor Claude Elliott tells Yahoo Canada News. “It’ll be an opportunity to reacquaint some old friends,” Elliott says. And on Friday a group of New Yorkers visited students in Gander schools to tell them about 9/11, the efforts made in their community 15 years ago, and the appreciation they still have today, CBC News reported. The story of Gander’s efforts also endures in a play, Come From Away, currently running in Washington, D.C., and heading next year to Broadway. Elliott was in the American capital this week to see the play but will be back home on Sunday to commemorate the 15th anniversary of 9/11 and the efforts in the Gander area. 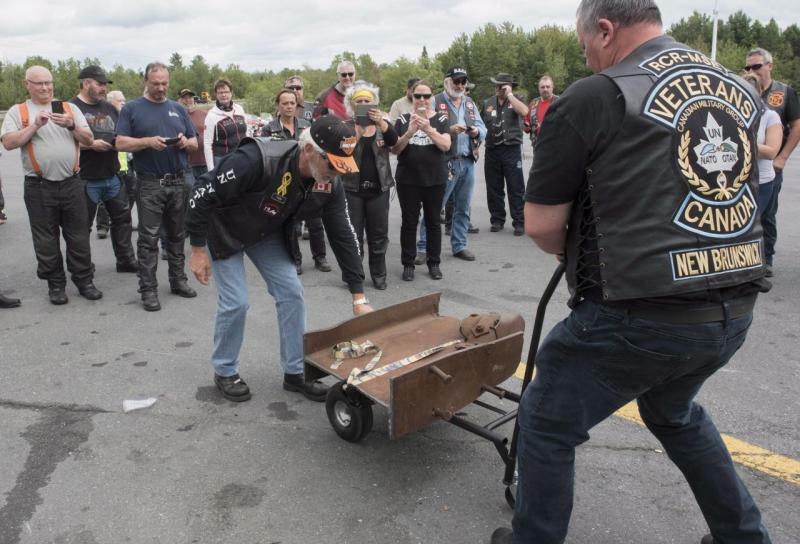 A piece of a steel beam from the World Trade Center’s south tower has been gifted to the town by the Stephen Siller Tunnel to Towers Foundation. The beam will be displayed in the airport that welcomed those 6,595 people and is set to arrive in Gander in time for a commemoration ceremony on Sunday afternoon. On the surface it may seem strange that planes were rerouted to a small town in a remote location instead of to major Canadian centres, but in the context of the quickly unfolding events on 9/11 it made a lot of sense, David Collenette, the federal transportation minister at the time, tells Yahoo Canada News. Collenette was making a speech to the heads of major international airports on the morning of 9/11, when he was passed a note telling him to wrap it up quickly because there had been a tragedy involving an airplane in New York. As Collenette and his staff rushed back to Ottawa from Montreal by car, it quickly became clear how serious the situation was. And when the United States closed its entire airspace decisions had to be made quickly about where to send the 500 planes with 85,000 people flying above the Atlantic Ocean, between Europe and North America. Some went back to Europe or to other eastern Canadian cities but more than three dozen of those planes were sent to Newfoundland — and in particular to Gander, a small town with an unlikely place in aviation history. Newfoundland was a strategic location for Allied forces during the Second World War, given its position on the eastern edge of North America, and as a result contains many long runways. 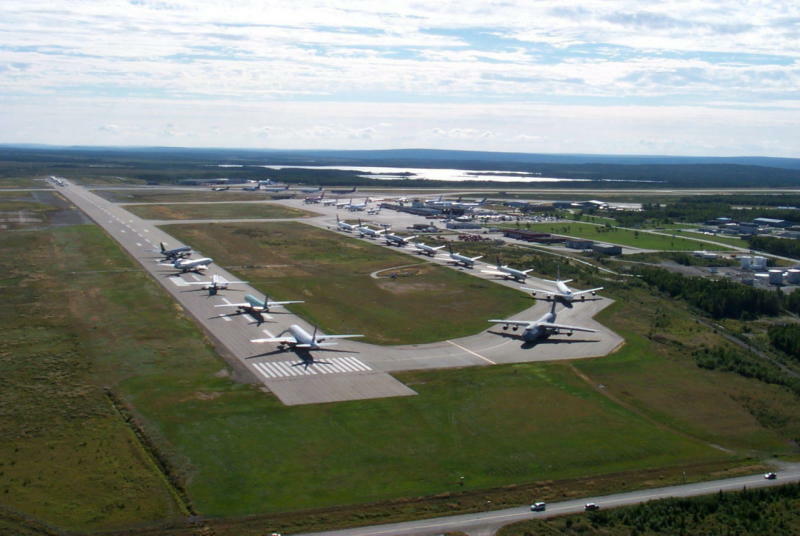 That includes the runways in Gander, which are 10,000 and 8,000 feet long and allowed the airport to handle landing a few dozen large commercial aircraft on short notice. Gander also had the advantage of being well removed from the rest of Canada and the border. When decisions were being made in the immediate aftermath of the attacks, nobody knew their planned scale or if more were coming, Collenette says. “If we agreed to land in Montreal or Toronto and there were terrorists on board, it would make it easier to go on to places like Chicago, Detroit, Buffalo, Boston,” he says. At the airport Goudie and other reporters were sequestered in a boardroom while passengers and crew waited on the planes as the officials required to process them in Canada were assembled. And on the ground in Gander, things were mobilized quickly. When she left the boardroom she saw that the Red Cross had set up tables in the airport that were covered in basic necessary supplies like toothpaste and deodorant, Goudie says. Gander school-bus drivers, who had been on strike, left the picket line to go to the airport and pick up passengers. Local hotels filled up quickly so people were brought to the local legion, schools and private homes. Over the five days that most of the passengers and crew were in the Gander area, residents provided not just practical support but also emotional comfort — including for some who had family caught up in the terrorist attacks. One couple, Dennis and Hannah O’Rourke, lost their firefighter son Kevin at the World Trade Center. Goudie remembers sitting with a woman whose husband was missing in New York — she never learned if he was found safe, but says the experience stayed with her. “I remember sitting with her, and her crying and telling me the story about how she couldn’t find him, and I went out to the car after and all I could do was cry,” Goudie says. The local telecom company provided access to phones so people could call home without charge. Retailers provided supplies from their shelves, and the SPCA took in pets that had been on the planes. People expressed their surprise that their hosts would leave them alone in their homes or hand over the keys to their cars when they went to work, Goudie says. “As the week progressed and people started realizing what was happening and what was going on, it was just amazing the stories and the gratitude and the emotion,” Goudie says. Collenette says the Charter of Rights and Freedoms and the efforts to safely land planes and house passengers and crew on 9/11 are the two events of his political career that stick out most clearly today,. Though the federal government led the efforts to reroute planes and provided financial compensation after the fact, it was provinces, municipalities and community groups that did the ground work of landing the planes, disembarking and processing passengers and crew, and sheltering people until they could go home. Mayor Elliott saw some of the lasting effects of those days while in Washington, D.C., this week, where he caught a performance of Come From Away. Goudie, who is the basis for a character in the play, was able to see a performance in Toronto and plans to attend one in Gander in October before it returns to Toronto and then heads to Broadway. The contrast of the humanity shown to those stranded in Gander with the attacks in the U.S. why the story the play tells still finds an audience 15 years later, she says.